This historical and cultural city is the capital of the Netherlands and is also one of the top locations for depositions. The Hague is home to the Netherlands’ parliament, many international treaties, as well as the birthplace to the Hague Conference. 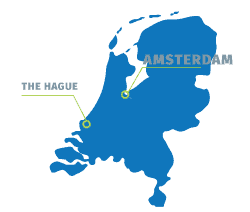 The Netherlands is a member of the The Hague Evidence Convention. Permission from the government is not required for depositions of willing witnesses. Court reporters are not authorized to administer the oath in the Netherlands, so the oath will need to be stipulated on the record. Another option is to hire an attorney in the Netherlands to administer the oath, which can be very costly. U.S.-trained court reporters and videographers throughout the world. Depositions in the Netherlands are simple and straightforward when you follow our deposition checklist. Planet Depos offers cost-effective and reliable realtime, transcription, and related services for arbitrations in the Netherlands. We provide modern and convenient conference rooms throughout the Netherlands. Prior to planning your travel to the Netherlands, be sure to review these travel tips from our experts.